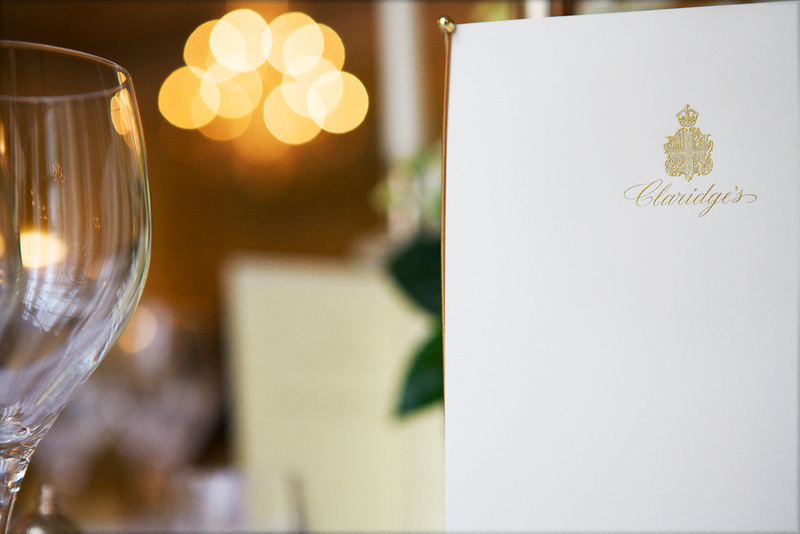 Claridge's needs no introduction. It is one of most famous hotels on the planet and an iconic brand. A new generation was made aware of this via the excellent BBC2 documentary last year which provided a fascinating glimpse behind the scenes and highlighted the hotel's amazing attention to detail. Working at the hotel always fills you with motivational nerves. At this wedding, my main concern was to capture as much detail of Janaina & Rory's day as possible. There was so much going on and photographs seemed to pop up again and again, all of them feeling absolutely vital at the time. Below is just a snippet from the final set. Once back from Mayfair's spectacular Farm Street church in Mayfair, a swift drinks reception paved the way for the wedding breakfast in the ballroom. I found myself trying to pack as much into the shoot as possible, very keen to provide an accurate memory of the obvious work that had gone into the preps. Below is just a sample from the final set. And I nearly forgot to mention the 'supplier meal' of Dover sole. It arrived, beautifully presented, from Gordon Ramsay's Michelin-starred kitchens. I felt very lucky that day. Perfection. If you ask me, London is the greatest city in the world. It has the lot. The streets are filled with a million fashions encased by every kind of architecture and there are places of interest to suit every taste and need. Much of my time is now spent working in this city and my enthusiasm just grows and grows for our wonderful capital. My personal relationship with the city began as a very small boy being shown around by my parents. Every weekend is was another sight or sound. Then, many years later when I started my A levels, it was with tremendous pride that I hopped on to the train every day to attend college near Euston station. My photographic relationship with the city started a few years later with some PR shoots via motorsport industry sponsors – an area in which I worked for over 15 years. Leaving that world behind, it came as a big shock to have my very first London wedding commission at the Institute of Contemporary Arts, just off The Mall. Gulp. Nerves = huge motivation. Since those initial inspiring days I have been so lucky to forge relationships with many truly amazing venues and shoot in some of town's greatest spaces, from the most famous hotels like Claridges, and The Savoy to vast churches such as Temple Church and cathedrals like Westminster Abbey. I’ve also shot weddings in more than a few of the city’s quirky spots. Variation is key. I believe that being able to shoot well regardless of the location is something a client should demand of a good photographer. I love the feeling, energy, excitement, drama and heritage of every nook and cranny of our sprawling gem of a city.